But try as they might, bands just can't compete with the decibel ranges produced by jet engines. They are, said Joe Nichols, among the loudest sources of human-made noise that exist. An assistant professor of Aerospace Engineering and Mechanics at the University of Minnesota, Nichols is fascinated by sound and its ability to find order in chaos – and by applying that understanding to the development of new technologies that can reduce noise in aircraft. Nichols is working with the Argonne Leadership Computing Facility (ALCF), a U.S. Department of Energy (DOE) Office of Science User Facility within the DOE's Argonne National Laboratory, to create high-fidelity computer simulations to determine how jet turbulence produces noise. The results may lead to novel engineering designs that reduce noise over commercial flight paths and on aircraft carrier decks. "Noise tells you something about the fundamental nature of turbulence, because noise reveals order that is otherwise hidden in complex, highly nonlinear, chaotic phenomena," he said. That is why jet noise presents both a challenging and a beautiful problem for Nichols. Jet engines produce noise in different ways, but mainly it comes from the high-speed exhaust stream that leaves the nozzle at the rear of the engine. And planes are loudest when they move slowly, such as at takeoff or at landing. As the exhaust stream meets relatively still air, it creates tremendous shear that quickly becomes unstable. The turbulence produced from this instability becomes the roar of the engine. Aeronautic engineers incorporate chevrons, broken eggshell-shaped patterns, into exhaust nozzle designs to change the shape of the jet as it leaves the engine. The idea is to reduce the noise by changing the pattern of the turbulence. But much of the design work remains a guessing game. Working with ALCF computational scientist Ramesh Balakrishnan and Argonne's supercomputer Mira, Nichols and his team are applying computational fluid dynamics to remove some of that guesswork. They start by conducting high-fidelity large eddy simulations that accurately capture the physics of the turbulence that is making the noise. From those simulations they extract reduced-order, or more concise, models that explain what part of the turbulence actually makes the sound. In addition to improving scientific understanding of jet noise, these reduced-order models also provide a fast, yet accurate, means for engineers to evaluate new designs. Simulating complex geometries like jet turbulence requires the use of an unstructured mesh—a non-uniform 3-D grid—to represent the dynamics involved. In this case, one simulation could have 500 million grid points. Multiply that by five to account for pressure, density and three components of velocity to describe the flow at every grid point. That equates to billions of degrees of freedom, or the number of variables Mira uses to simulate jet noise. 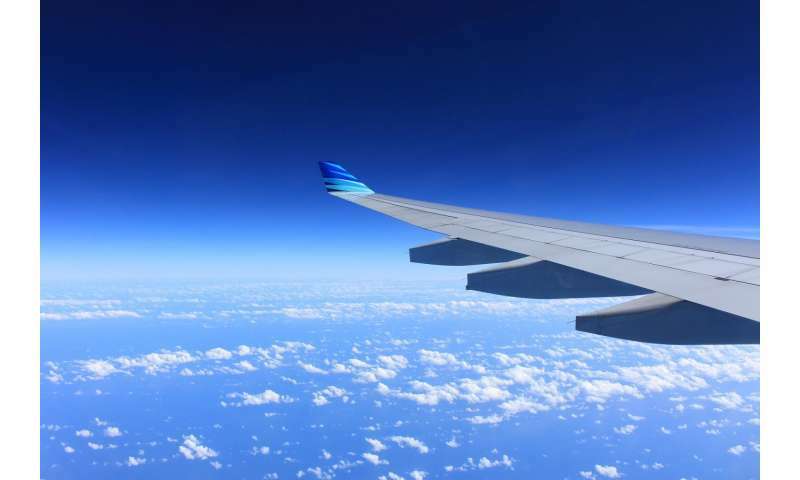 "But what if inside the jet turbulence there is a skeleton of coherent flow structures that we can describe with just 50 degrees of freedom," suggested Nichols. "Which aspects are most important to the jet noise production? How do the flow structures interact with each other? How closely can the skeleton model represent the high-fidelity simulation?" This work, published last year in the journal Physics of Fluids, could help engineers more precisely direct the modeling of jet engine nozzle geometries by determining, for instance, the ideal number and length of chevrons. "What distinguishes Joe's work from those of the other computational fluid dynamics projects at ALCF is that it involves the development of a method that could mature into becoming a design tool for aero-acoustics," said ALCF's Balakrishnan. "His project leverages computational data with what he calls input-output analysis, which reveals the origins of jet noise that are otherwise hidden in direct run-of-the-mill forward simulations, or even experiments." One of the leading ways to predict the instability waves that create sound inside of turbulence is through methods based on a type of computational tool called parabolized stability equations. But while they're good at predicting supersonic sound sources, they have a hard time predicting all the components of subsonic jet noise, especially in the sideline direction, or perpendicular to the exhaust stream. The University of Minnesota team developed a new method based on input-output analysis that can predict both the downstream noise and the sideline noise. While it was thought that the sideline noise was random, the input-output modes show coherent structure in the jet that is connected to the sideline noise, such that it can be predicted and controlled. Nichols also uses a variation on the input-output analysis to study noise produced by impingement, where a jet blast is directed at a flat surface, such as aircraft taking off from or hovering over an aircraft carrier deck. Like decibel-breaking guitar licks, impingement produces a feedback loop when the turbulence hits a flat surface and accelerates outward. As the noise loops back towards the jet nozzle, new turbulence is triggered, creating extremely large tones that can reach into the 170-decibel range and do structural damage to the aircraft in question. The team turned to Mira to conduct a high-fidelity simulation of an impinging jet without any modifications, and then measured the noise it produced. When compared to ongoing experiments, they predicted those same tones very accurately. A reduced-order model of the simulations helped Nichols more precisely predict how to change the jet configuration to eliminate feedback tones. Another simulation of the modified jet showed that the tones were almost completely gone. "The simulations play a crucial role because they let us see spatio-temporally resolved fluid motions that would be impossible to measure experimentally, especially if you're talking about a hot exhaust moving at Mach 1.5," noted Nichols. This research, says Balakrishnan, is still a work in progress, but the results are encouraging. While it still needs some refinement, it holds the promise of becoming a design tool that jet engine manufacturers may one day use to help quiet the skies. For electric guitar makers Fender and Gibson, on the other hand, perhaps not so much.